A while ago I was exploring photos on flickr, and stumbled across the amazing work of New Zealand photographer Kevin Best. 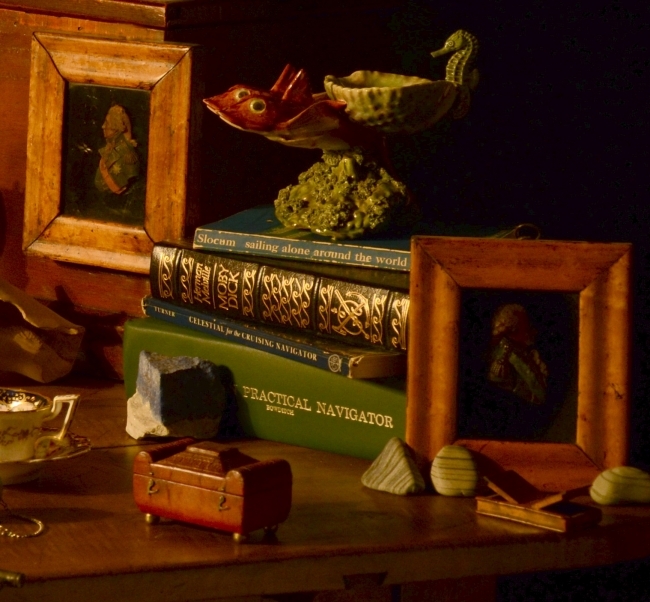 He specializes in still life photography in the style of Dutch master painters. Inspired by his work and a new interest in photography, I have started making some of my own photos with objects from our collection. Here is the latest example with a nautical theme. Take a closer look at the objects used in the photo above. 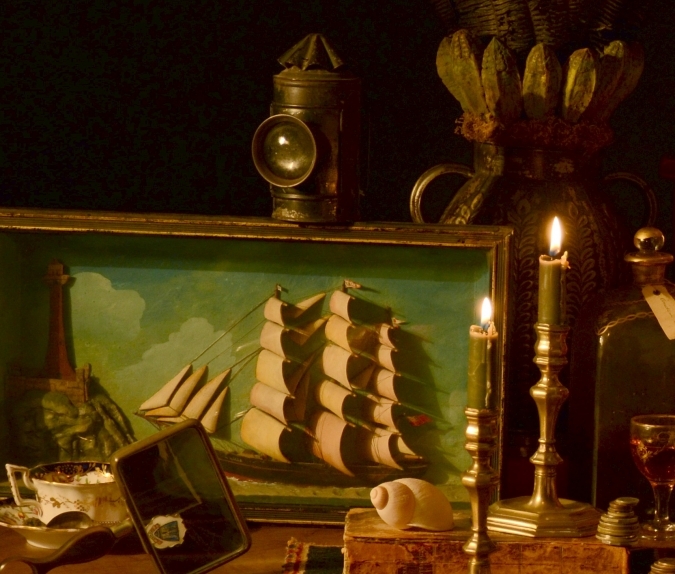 At the top right is an early 19th century wax portrait of a British naval hero. The tea pot, cup and saucer are part of a child's tea service for four. About 1930, it is marked Noritake from Japan. It includes 4 plates, 1 cream and covered sugar, and a cake plate. The upper candlestick is a rare and unusually small English brass Charles II candlestick. It has a trumpet base with mid-drip, circa 1660. These things sit upon a simple small green painted pine box, English mid 19th century. On the interior is written "4 Crabble St. Ipswich"
Tucked away, hiding in the back, is a blown glass dark green decanter with applied glass berries. The lower wax portrait is of British naval hero Admiral Sir John Jervis signed St. Vincent. In 1797, Jervis, with the British fleet, encountered the Spanish at the battle of Cape St. Vincent. Outnumbered almost two-to-one the British fleet prevailed. Jervis was hailed a hero and recieved the title of Baron Jervis of Medford and Earl St. Vincent. In the foreground rests a delightful small wall box with a leather hinge. 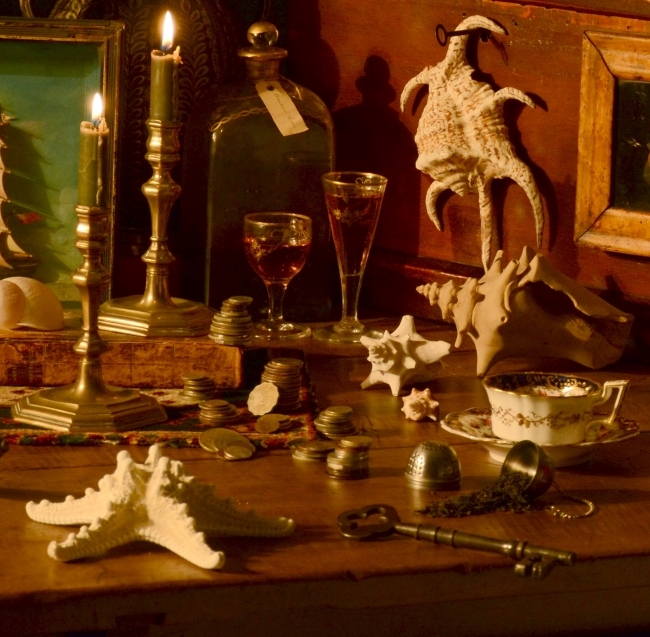 To the left of the box is a single English brass candlestick, mid 19th century. In this detail another wax portrait in a maple frame hangs from the red box. This bust is of Britian's most famous naval hero Vice Admiral Horatio Lord Nelson. To read more about him and wax portraits, read our other blog post here. Next is a whimsical English green dish in the shape of a shell resting on the back of two flying red fish with a seahorse handle. The fourth wax portrait is of Lieutenant General Sir Thomas Picton. He gained a reputation for couragous fighting in the Peninsular war and at the battle of Waterloo. Just in front of Sir Picton is a small English snuff box with two lids. To the left is a wonderful small Regency red leather box. It is an interesting sarcophagus form having impressed gilt decoration on top and brass ball feet. Pictured in the back here are two glasses and a liquor bottle. These are from a ship captain's liquor chest, probably from Spain around 1800. Inside the oak case are 6 large bottles, 6 small bottles, 2 wine glasses, 2 tumblers, and a funnel. They are all perfect, gilded, and have a curious paper label tied to the top. The bottle pictured reads "eniw anidam". Can you figure it out? Hint… my dyslexia helped me decipher them. To the right is a small English country pine box in red paint, early 19th century with strap hinges and blue papered interior. Moving foreword, there is a nice pair of English William and Mary brass baluster candlesticks. These candlesticks rest on top a square fragment, one of many from a large Bakhtiari carpet. Using them under lamps or other objects to protect a table from scratches is a fun decorative idea. The Rockingham cup and saucer belong to a larger tea service for six. There are 3 plates, a creamer, teapot, covered sugar, and bowl. 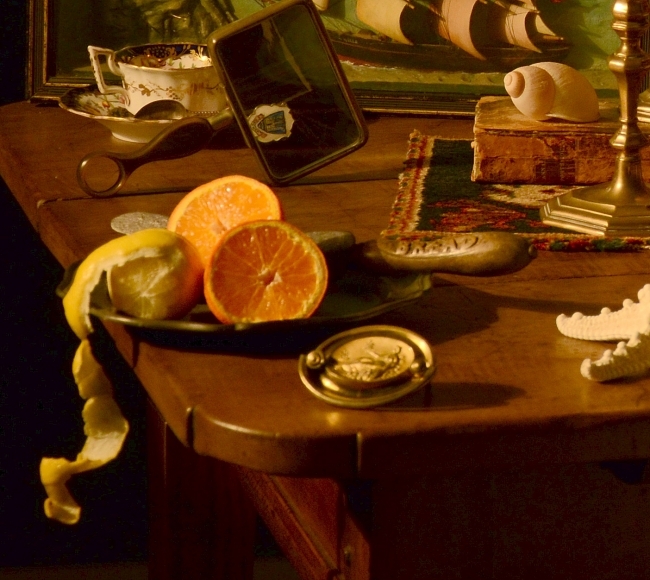 The second cup and saucer is in the next detail photo to the left. Along with antiques our inventory includes a wide variety of dried flower arrangements. Interesting containers are paired with unusual flowers, ferns, mosses, fruit, leaves, and sometimes feathers. An example of one is in the upper right of this detail shot. The arrangement has cigar flower, curled leaves, assagi, and mahogany pods. Next is an uncommonly small English 19th century shadow box diorama of a three masted British clipper ship with a lighthouse in the background. The ship's name is "Bella" and is sailing with full sail towards the rocky bluff. Balanced on top of the diorama is a late 19th century small Dietz lantern, sometimes referred to as a "police regular" lantern. The magnifying glass is balanced to enlarge the spoon handle behind it. The spoon reads "Conway" and has a castle with three towers in the shield. In the final detail, front and center, is an original stamped brass pull taken off an early 19th century Portsmouth NH chest of drawers. It's a great scene of a woman in a Grecian dress holding out an olive branch reclining on a cornucopia with a three masted schooner in the distance. A nice choice for a beautiful chest of drawers. Behind that is a simple Sheffield bread knife on a English pewter plate. 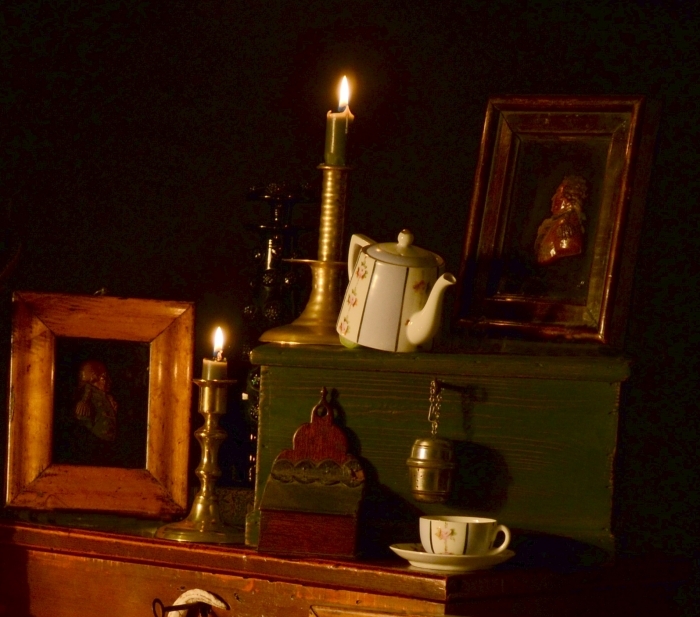 The first piece chosen for the photo is a late 19th century Hungarian table. It' been reduced in height for a more modern use as a coffee table. Made of cherry and oak it has a large drawer, stretcher base and nice patina on the top. At last, the staple motif of golden-age still life iconography, the half-peeled lemon. I had only one lemon. I cut hastily at the rind for it was late and I was tired. I think it worked out but if seen from the back you would find tape and toothpicks holding the rind from falling to the floor. In this busy photo there are a few personal things I didn't mention in the details. The rocks are from my Aunt Pam's collection. As a young boy I remember being thrilled when given coins collected from around the world by my Aunt Jo Ann, a flight attendant for Pan Am. There are memorable books from high school, and a selection of my collection of found and inherited sea shells. The larger of the three conch shells is actually wood, carved from a maple tree that fell on our property years ago. It was my first carving project. If you have come this far I recommend taking the time to look at the work of Kevin Best, for as his name suggests, he is. Your cousin Joan in Minneapolis told your cousin Louise in Kennewick about your website. Wow!! What fun! These compositions are stunning!! I will tell cousin Trilby to check this out. Inspired composition, especially all the diagonals. Will see you next Tuesday with your friend Marny from Cambridge.